Envelope is rated 4.2 out of 5 by 18. "I am a graphic designer… and I generally order printed pieces for my clients. Most clients who order envelopes also order matching letterhead as well. I can get the prices from the site, quote my clients immediately and get an order processed. Printplace.com is one of my few trusted partners"
Rated 5 out of 5 by BrigitteLaslo from Outstanding Products! The ordering process was clear and accurate and I loved the instant proofing process. Items were delivered in the timeline that was requested and the finished product was just what we requested. Very Happy. Rated 5 out of 5 by Jim 72 from Easy to Order! Good prices, and easy to navigate online order interface! Rated 5 out of 5 by Visit Stillwater from Great Quality We ordered 1000 greeting cards and envelopes with our own designs and they were shipped/delivered so quickly and looked great! You have more choices for sizes and styles when you print envelopes from PrintPlace. Our printing experts make sure that every job is done right by providing 1-color and full-color envelope printing and manufacturing on-site in our print shop. 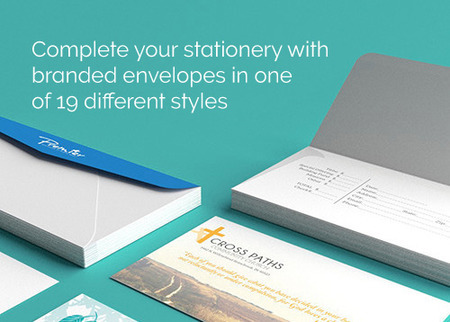 You can customize your envelopes to fit the needs of your business. Choose the right size and shape. Add your company logo or any design, then have them printed and shipped to you right away. Same-Day Printing: Our full-color envelopes can be printed on the same day you submit your design. We’ll ship them the day after you place your order. 1-color envelopes, on the other hand, can be printed in 2 business days. Here’s our quick guide to turnaround for more information. PrintPlace has layout templates to help you create envelopes to our printing specifications. There is a layout template for each envelope style that is easy to follow. Download the one that fits your job to show the correct bleed, blank address area, and more. Utilizing our direct mail services saves you time. We can insert your letters, booklets, and greeting cards then mail them for you. For a direct mail job that includes custom-printed envelopes, you need to select "Direct Mail Services" for only the envelope job. Give us a call at 877-405-3949 or chat with us for details on how to set up any direct mail job that includes envelopes. Direct mail jobs will add 2 business days on top of the original turnaround time specified. Prices vary depending on the size and weight of each piece. To verify your mailing rates, be sure to read our envelope mailing requirements. Printing envelopes enhances and reinforces your brand image. Envelopes convey a professional and uniform look for your business correspondence, and greatly increase the chance that your customers will read what is inside. Recipients are more likely to open a personalized envelope – and thus, more likely to read your marketing message. Envelope sizes #9, #10, A6, A7 and 6” x 9” all mail at the same postal rate as a 5” x 7”, 6” x 9” or 6” x 11” postcard, so why not mix up your marketing? Print envelopes and try mailing a letter for your next marketing campaign.